We Breed for Quality - Not Quantity! Tai and Junior had their puppies on January 21st. They had 4 puppies - all girls! Cheyenne our Schnoodle and Sundance had their puppies on January 29th. They had 2 Boys and 2 Girls. Kiwi and Sundance puppies were born on March 14th. They had 5 puppies - 4 boys and one girl. Black Parti Boy and Liver Parti Girl. Our OFFA Certificates for eyes and Cardio are here! You can find then on our Dams and Sires pages! All of our dogs have been tested for Cardio and ALL have passed! We are the only Mini Schnauzer breeder in Utah and the western part of the Unites States that carry the Canine health Information Center (CHIC) certification! Updated web page to reflect their certificates. Click on Advanced Search and search for O.S.S. as beginning of name. Scroll down to read more on this information. We do Genetic testing for the health of our parents and puppies. Early Neurological Stimulation (ENS) is a process we started doing that introduces mild stresses to very young puppies in a controlled way. In addition to testing for hereditary defects and maintaining clean and safe environments We at OneSmallSchnauzer go above and beyond and help nurture our pups from birth. We at OneSmallSchnauzer have discovered a great socialization technique known as the Rule of Seven. We are adding all of our OFA registration Certificates on each of our dogs to the website next to their pictures. This is done at our expense to ensure that our parents are giving you the best healthy and happy puppy! 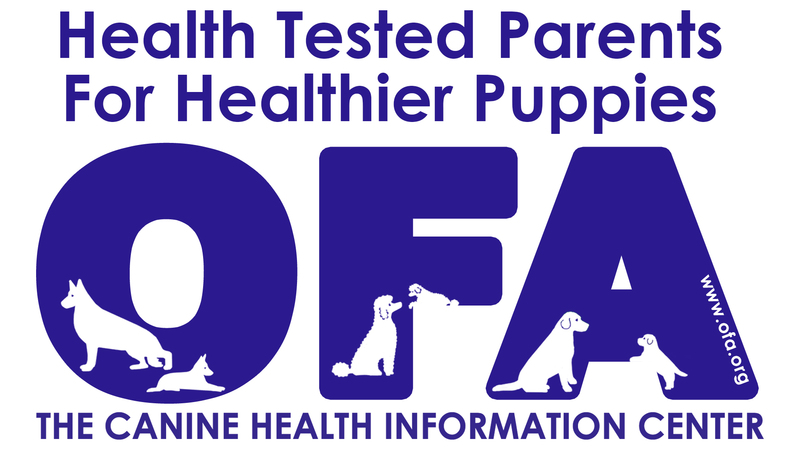 Once the tests are completed the BREEDER is required to send in the test results to OFA so that they can be recorded and released to the public. If the test results are NOT mailed in they will NOT show up to the public in the database but are recorded. To collate and disseminate information concerning orthopedic and genetic diseases of animals. To advise, encourage and establish control programs to lower the incidence of orthopedic and genetic diseases. To encourage and finance research in orthopedic and genetic disease in animals. To receive funds and make grants to carry out these objectives. "To provide Schnauzer lovers looking for a forever pet a Top Quality Teacup and Toy Schnauzer from a clean, friendly and social environment, and to ensure that your Top Quality puppy is loving, has great conformation, is sociable, and will be healthy for the rest of their lives and yours! We are totally committed to being a reputable, loving, honest, loyal and responsible Toy and Teacup Schnauzer breeder!" Our Vet stands behind our breeding program for the love and care that our dogs and puppies are given. If you are interested in speaking with our Vet, please contact us! Big Commitment - Our "Dogs"
Do you know why some people or breeders only show pictures of their dogs in a setting or with fences or kennels? Because that is where their dogs live. They don't show updated pictures of their dogs or them being inside in the house getting attention and played with. No dog that lives in a kennel gets the attention that it needs. they get fed and watered, and if they are lucky they get cleaned. They don't get petted or played with daily or get to snuggle. Thats why we here at O.S.S. are different than most breeders. We show our dogs in the house relaxing and playing and eating, because that's where our dogs live - inside with us, not locked up in a kennel or outside. We take updated pictures all of the time and post them so you can see how happy and healthy they are, and the clean environment in which they live in. 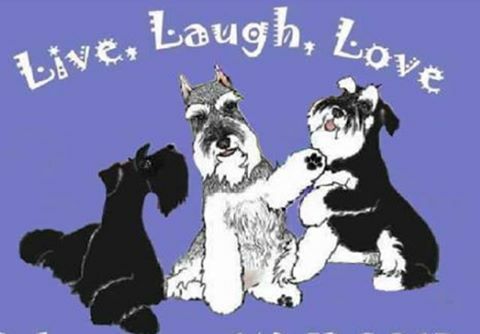 We love our Schnauzers and other doggies so much, and love to share them with you! Send us an email so we can put your name our waiting list! We offer you a 5 year health guarantee because we are so confident in the health of our breeding, we can provide this contract to you. All our puppies receive the best health care prior to going to their new homes. All puppies are vet checked twice before leaving our home. We have observed the health, and well-being by our expertise and good nutritional practices. We have observed that all our puppies and adult dogs are in excellent health and free from genetic defects. We have observed that the parents of the puppy you choose are in excellent health and free from known genetic defects. Our dogs eyes have been tested for healthy eyes, especially our Blue Eyed Schnauzers. The purpose of the OFA Eye Certification Registry (CAER) is to provide breeders with information regarding canine eye diseases so that they may make informed breeding decisions in an effort to produce healthier dogs. CAER certifications will be performed by board certified (ACVO) veterinary ophthalmologists. Regardless of whether owners submit their CAER exam forms to the OFA for “certification,” all CAER exam data is collected for aggregate statistical purposes to provide information on trends in eye disease and breed susceptibility. Please see our Links page to visit the OFA.ORG website. Here is a link to one of the sites we use for our puppies. Make sure you check out the Breeding and Puppy articles. There is great information located here that we use on our puppies and that you can use on yours also! New Crate. (ONLY when puppy is being shipped by Air Cargo) Hand carried you will need to provide carrier. Your puppy's blanket to help ease transition. Tube of NutriCal or Nutria-Stat if needed. Updated current vaccinations for Parasites and updated worming starting at 2 weeks of age. Tails docked and dew claws removed at 3-5 days of age. Your schnauzer puppy will come bathed and groomed and full of kisses and loves! We want you to be happy with the puppy. If you're not happy, the puppies not happy. A happy home is a happy puppy! "Top Quality Teacup, Toy and Miniature Schnauzer puppies!" "Many will walk in and out of your life but only true friends will leave paw prints on your heart!" Welcome to Shanel's One Small Schnauzer. We are dedicated to bring you only TOP QUALITY Toy and Teacup Schnauzers at Affordable prices.We have been raising Schnauzers for many years for family enjoyment. Our dogs are raised and loved from birth inside our home as members of our family with other dogs, birds and kids. They are all very well socialized. We are not a kennel. We just love to raise a few litters of puppiesa year for our enjoyment and yours. We have selectively picked our Schnauzers to produce the healthiest and happiest Schnauzer possible. We feel a quality Schnauzer is bred for correct conformation, appealing colors and markings as well as an affectionate, loving temperament. We are a reputable small breeder and have references. Teacup Schnauzers are the smallest of the miniature schnauzers. The American Kennel Club does not recognize toy and Teacup Schnauzers as breeds, so they are often registered as miniature schnauzers. Teacup Schnauzers grow to be less than seven pounds. They are hypoallergenic to people and they don't shed. Easily trainable, the intelligent Teacup Schnauzer is sociable with children and the elderly. Find a reputable miniature schnauzer breeder who also offers teacup schnauzers. Make sure the breeder offers a health contract or good health guarantee that lasts at least two years, preferably five years. We offer our health guarantee for five years! Health guarantees will give you options if your puppy is later diagnosed with genetic defects. Ask the breeder if the puppies are current on vaccinations and worming. Make sure the breeder has copies of veterinary records for the puppies. Find out if the puppies have been registered as miniature schnauzers with the AKC. Discuss how the breeder has started socializing the puppies. Find out if they have been introduced to people, other dogs, cats or anything else. Select a puppy with good conformation. It is difficult to gauge what the puppy's conformation will be like when it's fully grown, but make sure every part is proportional. Choose a puppy with a good personality. Teacup schnauzers vary tremendously in personality, and it can be difficult to evaluate personality in puppies, but make sure your puppy's energy level is not lower than the other puppies'. Feel free to look at all my pages and if you have any questions feel free to e-mail us or call. Thanks so much for taking the time to visit us !!! "A Healthy Puppy is a Happy Puppy!" All of our Schnauzers are AKC Registered unless otherwise stated. Teacup and Toy Schnauzers are assertive, energetic, affectionate and playful little babies. They love to play with toys and love attention and affection from their family. They have the same personality as the Miniature Schnauzer - nothing has changed except the size. While very responsive in obedience training, this breed is extremely smart and learns fast so they are easy to train! All of our puppies are fed 4 times a day. All of our puppies are started on potty training,crate training and using the doggy door. Your new little baby will come home with a Health Certificate, Vet Records, Registration papers, a blanket, puppy food, a toy and a crate if being shipped. I have been in the position of having a dog shipped from somebody I don't know and it is scary wondering if your going to get what you paid for. I will do everything to make sure you get what you pay for.. Please leave us a message! Contact us anytime to get more information about our puppies. Leave us a message on our Guestbook or call us at our cell (435)730-6299. Ask for Shanel or Curt. This website is operated by OneSmallSchnauzer. 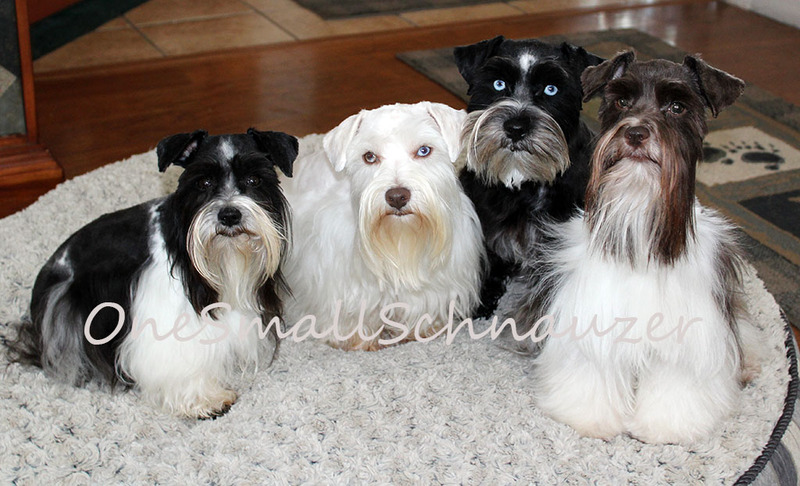 Throughout the site, the terms “we”, “us” and “our” refer to OneSmallSchnauzer. OneSmallSchnauzer offers this website, including all information, tools and services available from this site to you, the user, conditioned upon your acceptance of all terms, conditions, policies and notices stated here. By visiting our site and/ or purchasing something from us, you engage in our “Service” and agree to be bound by the following terms and conditions (“Terms of Service”, “TOS”), including those additional terms and conditions and policies referenced herein and/or available by hyperlink. These TOS apply to all users of the site, including without limitation users who are browsers, vendors, customers, merchants, and/ or contributors of content. Please read these TOS carefully before accessing or using our website. By accessing or using any part of the site, you agree to be bound by these TOS. If you do not agree to all the terms and conditions of this agreement, then you may not access the website or use any services. If these TOS are considered an offer, acceptance is expressly limited to these TOS. Any new features or tools which are added to the current store shall also be subject to the TOS. You can review the most current version of the TOS at any time on this page. We reserve the right to update, change or replace any part of these TOS by posting updates and/or changes to our website. It is your responsibility to check this page periodically for changes. Your continued use of or access to the website following the posting of any changes constitutes acceptance of those changes. 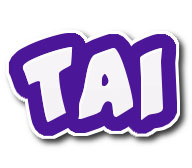 ** We DO NOT accept credit cards or other payment type on this site. ** All transactions are done through PayPal. By agreeing to these TOS, you represent that you are at least the age of majority in your state or province of residence, or that you are the age of majority in your state or province of residence and you have given us your consent to allow any of your minor dependents to use this site. A breach or violation of any of the TOS will result in an immediate termination of your Services. The headings used in this agreement are included for convenience only and will not limit or otherwise affect these TOS. All photos and material on this webpage are owned by OneSmallSchnauzer. 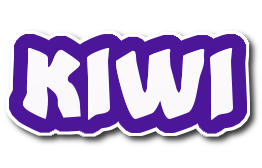 Using pictures or copying any text or information from this site without prior written permission is strictly prohibited and is considered theft. We reserve the right to refuse any order you place with us. We may, in our sole discretion, limit or cancel quantities purchased per person, per household or per order. These restrictions may include orders placed by or under the same customer account and/or orders that use the same shipping address. In the event that we make a change to or cancel an order, we may attempt to notify you by contacting the e-mail and/or address/phone number provided at the time the order was made. We reserve the right to limit or prohibit orders that, in our sole judgment, appear to be placed by dealers, resellers or distributors. We may also, in the future, offer new services and/or features through the website (including, the release of new tools and resources). Such new features and/or services shall also be subject to these TOS. We may, but have no obligation to, monitor, edit or remove content that we determine in our sole discretion are unlawful, offensive, threatening, libelous, defamatory, pornographic, obscene or otherwise objectionable or violates any party’s intellectual property or these TOS. In addition to other prohibitions as set forth in the TOS, you or any other breeder are prohibited from using the site or its content: (a) for any unlawful purpose; (b) to solicit others to perform or participate in any unlawful acts; (c) to violate any international, federal, provincial or state regulations, rules, laws, or local ordinances; (d) to infringe upon or violate our intellectual property rights or the intellectual property rights of others; (e) to harass, abuse, insult, harm, defame, slander, disparage, intimidate, or discriminate based on gender, sexual orientation, religion, ethnicity, race, age, national origin, or disability; (f) to submit false or misleading information; (g) to upload or transmit viruses or any other type of malicious code that will or may be used in any way that will affect the functionality or operation of the Service or of any related website, other websites, or the Internet; (h) to collect or track the personal information of others; (i) to spam, phish, pharm, pretext, spider, crawl, or scrape; (j) for any obscene or immoral purpose; or (k) to interfere with or circumvent the security features of the Service or any related website, other websites, or the Internet. We reserve the right to terminate your use of the Service or any related website for violating any of the prohibited uses. In no case shall OneSmallSchanuzer, the owner, co-owner or webmaster be liable for any injury, loss, claim, or any direct, indirect, incidental, punitive, special, or consequential damages of any kind, including, without limitation lost profits, lost revenue, lost savings, loss of data, replacement costs, or any similar damages, whether based in contract, tort (including negligence), strict liability or otherwise, arising from your use of any of the service or any products procured using the service, or for any other claim related in any way to your use of the service or any product, including, but not limited to, any errors or omissions in any content, or any loss or damage of any kind incurred as a result of the use of the service or any content (or product) posted, transmitted, or otherwise made available via the service, even if advised of their possibility. Because some states or jurisdictions do not allow the exclusion or the limitation of liability for consequential or incidental damages, in such states or jurisdictions, our liability shall be limited to the maximum extent permitted by law. You agree to indemnify, defend and hold harmless OneSmallSchanuzer harmless from any claim or demand, including reasonable attorneys’ fees, made by any third-party due to or arising out of your breach of these TOS or the documents they incorporate by reference, or your violation of any law or the rights of a third-party. In the event that any provision of these TOS is determined to be unlawful, void or unenforceable, such provision shall nonetheless be enforceable to the fullest extent permitted by applicable law, and the unenforceable portion shall be deemed to be severed from these TOS, such determination shall not affect the validity and enforceability of any other remaining provisions. These TOS are effective unless and until terminated by either you or us. You may terminate these TOS at any time by notifying us that you no longer wish to use our Services, or when you cease using our site. If in our sole judgment you fail, or we suspect that you have failed, to comply with any term or provision of these TOS, we also may terminate this agreement at any time without notice and you will remain liable for all amounts due up to and including the date of termination; and/or accordingly may deny you access to our Services (or any part thereof). The failure of us to exercise or enforce any right or provision of these TOS shall not constitute a waiver of such right or provision. These TOS and any policies or operating rules posted by us on this site or in respect to The Service constitutes the entire agreement and understanding between you and us and govern your use of the Service, superseding any prior or contemporaneous agreements, communications and proposals, whether oral or written, between you and us (including, but not limited to, any prior versions of the TOS). Any ambiguities in the interpretation of these TOS shall not be construed against the drafting party. These TOS and any separate agreements whereby we provide you Services shall be governed by and construed in accordance with the laws of the county of Box Elder, State of Utah, United States. You can review the most current version of the TOS at any time at this page. We reserve the right, at our sole discretion, to update, change or replace any part of these TOS by posting updates and changes to our website. It is your responsibility to check our website periodically for changes. Your continued use of or access to our website or the Service following the posting of any changes to these TOS constitutes acceptance of those changes. Questions about the TOS should be sent to us at onesmallschnauzer@yahoo.com. Copyright© 2003-2019 OneSmallSchnauzer. All Rights Reserved.